"Star Trek Beyond" (2016) is the third film in the most recent "Star Trek" movie series, which takes place in an alternate timeline from the rest of the franchise. 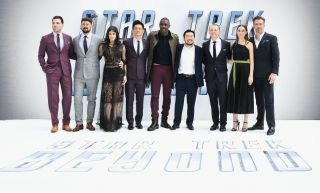 Since it premiered on July 22, "Star Trek Beyond" has been a hit with both audiences and critics: According to the website Rotten Tomatoes, 83 percent of critics and 84 percent of noncritic viewers enjoyed the film. But that success isn't necessarily showing up in the film's bottom line: Forbes reported that the film's opening weekend earned less than each of the last two films of the rebooted "Star Trek" franchise. Luckily for Trekkies, a fourth film is in the works. It will feature the return of Chris Hemsworth, who played Capt. James T. Kirk's father, George, in the 2009 "Star Trek" film. It's a big coup, considering Hemsworth has become an A-lister since the Marvel movie "Thor" hit the big screen two years after his "Star Trek" debut. So this really, really needs to be addressed. The Klingons were the mortal enemy of Starfleet in the original "Star Trek" series, and they made some awesome appearances when that series hit the silver screen in the 1970s, 1980s and 1990s. Remember when Cmdr. Kruge (Christopher Lloyd) killed Kirk's son? Or the deception of the Klingon sisters Lursa and B'Etor? The Klingons were among the movies' most memorable characters. The Klingons were working in Starfleet by the time "The Next Generation" (TNG) rolled around, and we get it: It's hard to go back to a time when the Klingons weren't our friends. But with the alternate-universe sandbox this new "Star Trek" franchise plays in, we really want some answers about what the Klingons think of Starfleet. In the new "Star Trek," do they get along? Think about the appeal of Superman, Batman or even Bugs Bunny. Part of the fun with these characters is watching what happens when the same villain shows up again and again to foil the hero. What will Bugs Bunny do this time when Elmer Fudd goes "wabbit-hunting" for him? Or, in a more contemporary example, aren't you as excited as we are about the new Joker (played by Jared Leto) in DC Comics' "Suicide Squad" (which premieres this Friday)? A villain can help to build audience loyalty. And as Megamind pointed out in the eponymous 2010 film, it's hard for a hero to exist unless there is an evil being to fight against. Let's bring back a well-known "Star Trek" villain who can help move the movies forward. For example, bring on the terrifying Borg that, to this day, is used as an example of the challenges of assimilating races. Or if you want a more humorous take, bring back "Q," the mischievous TNG character who loved playing dress-up to make a point about the stupidity of human beings. Without getting too far into plot spoilers for "Beyond," let's just say it's frustrating when Spock (Zachary Quinto) talks about the plight of his endangered Vulcan race, making its way on a planet called New Vulcan. Recall that his planet was destroyed in the 2009 film. We haven't seen much of the Vulcans since, except for cameo appearances from the late Leonard Nimoy, who played Spock Prime, and a few sightings of Vulcans here and there. What the heck are the Vulcans doing? Are their hopes of keeping the Vulcan culture alive actually working? And tell us about New Vulcan: what system is it located in, and is the new planet a desert-like one as well? Was the planet terraformed to make it more habitable? We could make a whole movie about New Vulcan alone, but at the very least, Spock should visit it in a future movie. As we pointed out in a recent article, a huge recurring element in "Star Trek" films is to destroy the Enterprise or almost destroy the Enterprise. The crew sees the Enterprise as a beacon of safety in an unpredictable universe, so we guess that blowing it up repeatedly is a fun way to introduce tension into the situation. These are absolute staples of the "Star Trek" world. Yes, yes, we know the J.J. Abrams-Justin Lin "Star Trek" movies already take place in an alternate universe to the original series, but we'd like to see more done with these ideas. For example, maybe the next movie could have Capt. James T. Kirk (Chris Pine) somehow cross back to the other universe where his dad is still alive, Vulcan isn't blown up and we aren't confused about which Spock is which. Or maybe parallel-universe crewmembers could run around the Enterprise and wreak havoc, like in the classic episode "Mirror, Mirror" from the original series. Time travel is also a theme explored over and over again in "Star Trek," whether the crew is rescuing whales or heading back to the Wild West. Could we have a movie, please, where we get to see the 1960s, when "Star Trek" debuted on television? Or maybe warp back to today and make a little fun of our habits, such as our crazy antics while playing "Pokémon Go"? Where would you send the Enterprise?